Whats up people! 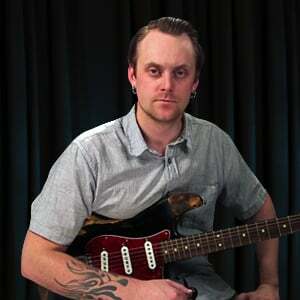 This is Henrik for Guitar Tricks and today we're gonna learn how to play the 90s classic "Outshined", as made famous by Soundgarden. We'll be taking a look at 3 different guitars today, two of the guitars will lay down some thick rhythm playing and guitar 3 will handle the leads and licks. We're going to use drop D tuning for this song, meaning we're going to only tune down the low E string one whole step to D.
The song kicks off with a heavy riff and the two rhythm guitars are both in from the top, playing the riff 4 times before the vocal comes in. One very interesting thing about this riff specifically is that it's played in 7/4 time signature. We're going to continue playing the riff in the verses and guitars 1 and 2 will add some licks at the end of certain phrases. In the pre-chorus we're going to leave the riff and play some really interesting voicings and change up the feel and switch the time signature to 4/4. Next we move into the chorus, which has another huge catchy riff that is based on the vocal melody - we'll be playing a lot of chunky power chords with the drop D tuning here. After the chorus we basically go back to a re-intro, but now with a solo on top. In the next verse the lead guitar is going to play along with the vocal melody while the rhythm guitars play the verse riff. Then we move along the same way as before through another pre-chorus and chorus and we're going to end up in the bridge. Here the song breaks down and we're going to look at a cool double stop part that has some really interesting rhythms as well. Next we hit another pre-chorus and then the last chorus of the song. Another little time signature twist will appear in the last chorus - when we go to cycle the chorus the second time there's a bar of 6/4 and then a bar of 5/8. This sounds complicated but it's more about just listening to how the band plays through these odd meter bars, rather then trying to do math and count it out. The song will go through a couple of time signature changes but we'll stay mostly in 7/4 and 4/4 at a tempo of 96 beats per minute.